• Upholding basic rights to victims of sexual assault. • Facing possible fines from the U.S. Department of Education when schools fail to comply with the Clery Act. 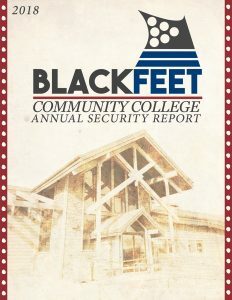 The safety and well being of faculty, staff, students and visitors are of the greatest concern for Blackfeet Community College. Creating and maintaining a safe campus requires the cooperation and involvement of everyone. Prompt reporting aids in providing timely warning notices to the campus community when appropriate, may aid in the prevention of similar crimes and may assist in the investigation and the apprehension of the perpetrator(s). Reporting crimes is necessary to ensure inclusion in annual crime statistics. BCC encourages accurate and prompt crime reporting when the victim of the crime elects to report or when the victim is unable to make a report, to ensure that all crimes are included in the institution’s Clery Act statistics. The security personnel of BCC are the eyes and ears of the college and are not sworn law enforcement. Therefore, any action that requires law enforcement is turned over to Blackfeet Tribal Police Office and Glacier County Sheriff’s Office. BCC Security has a close working relationship with Tribal Law & Order and Glacier County Sheriff’s Office. The College is coordinated with local law enforcement agencies for services relating to crime reports and investigations, campus emergencies, traffic accidents. The enforcement of institutional regulations regarding alcohol consumption, controlled substances, weapons possession and other incidents classified as Clery Act crimes are to be filed with the campus Security Patrol Officer and statistically published in the annual security report. Contact Security Patrol Officer at 406-845-3294 for further information concerning security on campus. 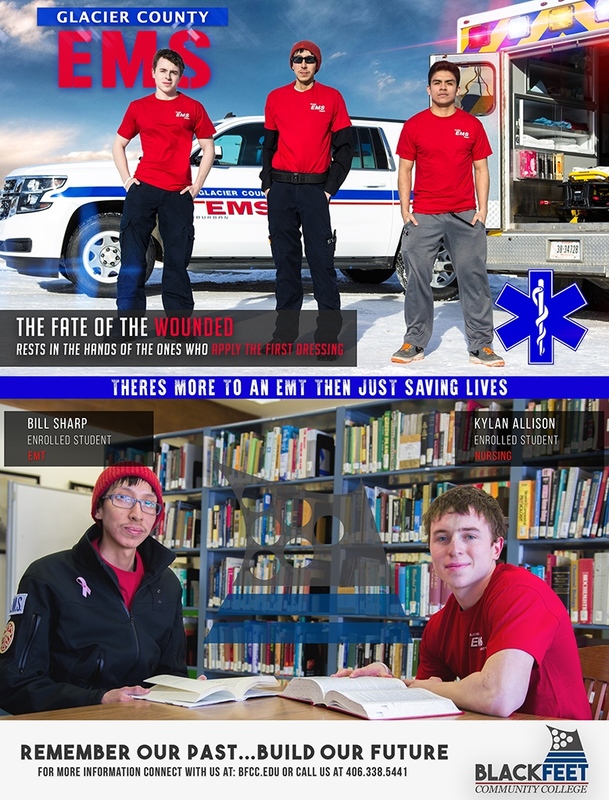 In the case of an emergency dial 911 or 406-338-4000 for local police and ambulance. All students must refrain from using any and all BCC equipment including but not limited to, offices, copiers, phones, coffee pots, office computers, etc., Unless specifically authorized. In the event of the school closing due to weather or other emergency situations, the closing would be announced on the following radio station(s): KSEN AM 1150 & KZIN FM 96.7, KBWG 107.5, RAVE and posted on BCC Social Media Sites. Students will be notified immediately of a campus bomb threat. Students are to report immediately to the Southwind Lodge parking lot, at the entrance to the campus and wait for further instructions. Do not take your vehicle unless you are informed that it is safe to do so. Instructors or a Blackfeet Community College employee will make sure the classroom/office is evacuated, close the door upon leaving the room and accompany the students to the safety zone. “Smoke-Free Building” prohibits smoking in all BCC buildings. Students shall comply with this policy and refrain from smoking in accordance with the requirements in any BCC facility. Tribal Ordinance 102-2005, smoking is prohibited within 25 feet of the building. • Shooting off fire extinguishers, or damage, tamper with, dismantle, or disconnect fire safety systems or equipment. Blackfeet Community College’s Sexual Harassment Policy forbids sexual harassment of any member of the college community. The complete policy is on file in the Human Resource Office.